#328 – Do NOT Open Until Dec. 25th! We hope you all have a wonderful & safe holiday with your families and friends! Johnny the Homicidal Maniac is one of Scotte’s very favorite comic books, written by Jhonen Vasquez. 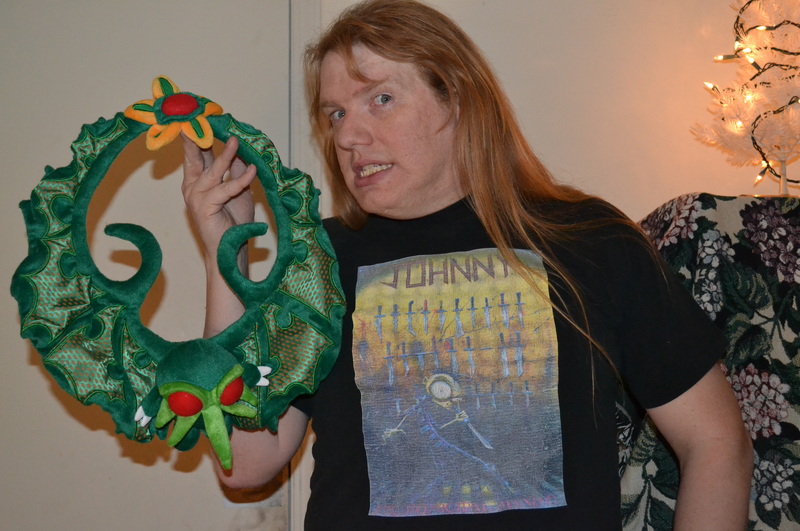 Skotte is holding a Cthulhu wreath which seemed appropriate with this shirt. And what, you may ask, is a Cthulhu wreath? Well, it’s a wreath made out of Cthulhu, who is a “cosmic entity” created by H. P. Lovecraft. Lovecraft is not for everyone, and probably Vasquez isn’t either. But they are both definitely for us! So settle in with whatever makes you happy, and have a wonderful Christmas!